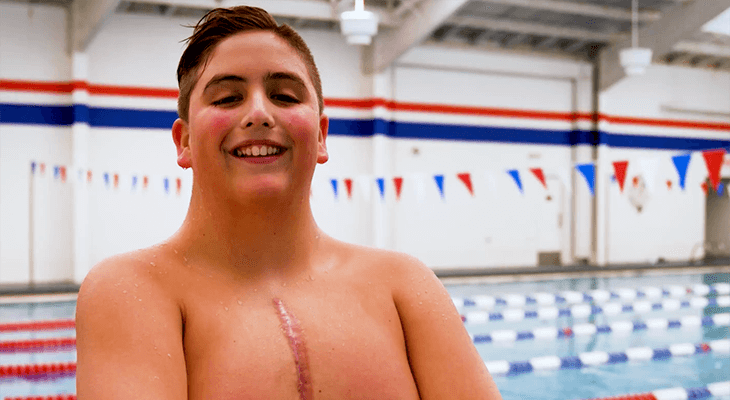 After five open heart surgeries, teen turns his attention to giving back | Norton Children's Louisville, Ky.
Evan Karr is an active 14-year-old who swims and likes to have fun with his friends. But underneath his brave exterior is a young man who was born with tetralogy of Fallot — a rare condition made up of four heart defects that cause the heart to pump oxygen-poor blood into the body. He is thriving after five open heart surgeries and nine cardiac catheterization procedures. His story shows not only his strength, but that of his family. Evan had his lifesaving surgeries at Norton Children’s Hospital. Now, he and his mother are helping the Children’s Hospital Foundation raise funds for the hospital’s new Jennifer Lawrence Cardiac Intensive Care Unit. A $2 million gift from the Lawrence Family Foundation challenged the community to raise an additional $2 million for the unit. The Jennifer Lawrence Cardiac Intensive Care Unit will feature specialized space for children recovering from procedures including heart transplants and heart failure surgeries. The unit is part of a large renovation currently underway at the hospital. Join Evan in supporting construction of this new unit that will help hundreds of children each year. Designate your gift to the Jennifer Lawrence Cardiac Intensive Care Unit. Norton Children’s Hospital, working with specialists from UofL Physicians, is home to the only pediatric heart failure and transplant program serving Kentucky and Southern Indiana. The program is made up of a specialized team that includes a heart failure cardiologist, electrophysiologist, interventional cardiologist, cardiovascular surgeon, transplant surgeon, cardiovascular anesthesiologist, intensive care physicians, specially trained pharmacist, social worker, child life therapist, specially trained nurses, a family support team and a rehabilitation specialist.